Tom Ballhatchet, of Hamster Paper Shredder fame, has gone on to develop a better model. 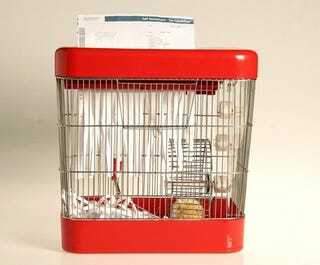 The cage's top and bottom are now matching in lipstick red, and there are slots for depositing food and water next to the paper slot. Gearing is internal, which makes us wonder about Hammy's safety, but if you look carefully and think about it, the lil guy won't get chewed up in the gears if he's running in the wheel.